OPEN FOR BUSINESS…ARGON INDUSTRIES NOW OFFERS IN-HOUSE POWDER COATING. We are truly a one stop sheet metal fabricator. We now can manufacture from raw materials to powder coat to assembly to packaging and shipping to the customer, all under one roof. No more sending product out hoping it does not become damaged, lost, or misplaced. No more repackaging of product after inspecting for quality. No more discussions of who is responsible for painted products. We control the complete process. – APT (Advanced Pretreatment Technology) Which means the pretreatment technology is phosphate free and Eco-Friendly that meets or exceeds the performance of zinc-phosphate surface treatments. – A wide range of products can be powder coated with the opening of 4ft wide x 7ft high x 10 long parts. – Stage 1 pickling cleaning for removal of laser, weld and mil-scale. – Alkaline cleaning for organic soil removal on iron and aluminum substrates. – Final rinsing with Reverse Osmosis Water. – Brand New High Efficiency Manual Quick Change Booth…Change colors in less than 2 minutes. – Automated 12 gun powder booth for high volume runs. – Both booths housed in an environmentally controlled room for controlled heat and humidity ensuring consistent application of powder. 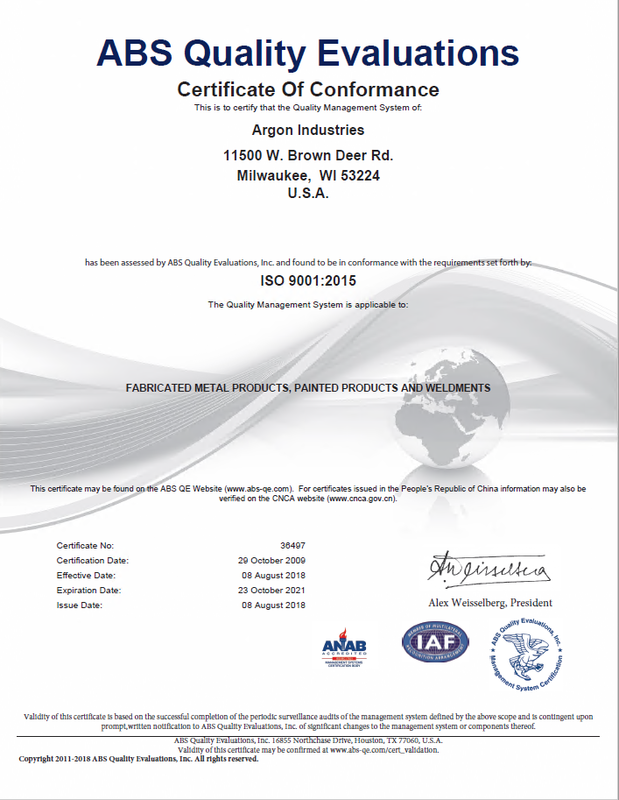 Argon Industries, Inc. Powder Coat Line has been awarded an “Approved Applicator Certificate” for Tiger Drylac’s exclusive series 58 and 75 High Performance Architectural Powder Coatings. - Up to 25 years limited exhibit warranty for components manufactured from aluminum substrates and coated with Series 58 Super Durable Polyester-based powder coatings. Series 58 meets AAMA 2604-05 standards. - Up to 30 years limited warranty to approved applicators in good standing, when proper documentation is provided to TIGER Drylac U.S.A. Inc., for components manufactured from aluminum substrates and coated with Series 75 Fluoropolymer-based powder coatings. Series 75 meets AAMA 2605-05 standards. – Our Powder Coat System in UL Certified. – Independently tested and exceeded the stringent GM9540 STANDARD.